“Start with a clean, dry surface,” says paint expert Shawn Mylacraine. Next, tape off the pattern with thin painter’s tape. Both Mylacraine and fellow expert Rhan Harris recommend 3M’s 2080 Scotch-Blue Painter’s Tape for Delicate Surfaces (3m.com). Run a slightly damp rag along the tape, pressing to remove any air bubbles. Paint the stripe and allow it to dry thoroughly. 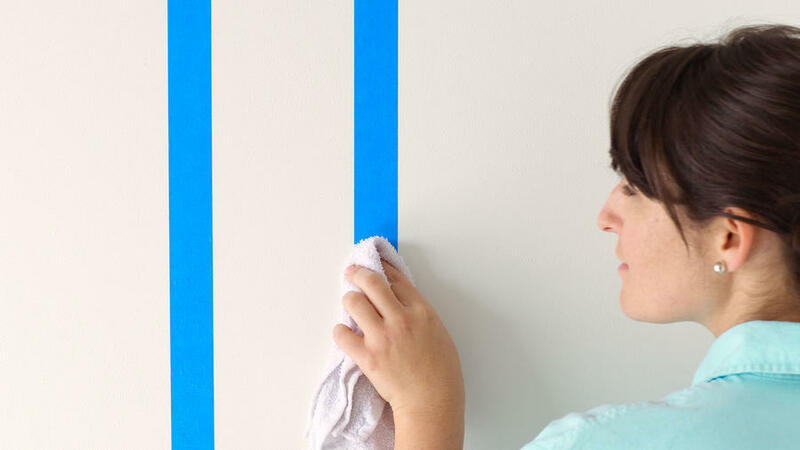 Note: If the wall is textured, first paint a coat of the wall color over the exposed area—where you’ll paint the stripe—and the inner edge of the tape to create a complete seal. Be sure to let that coat dry overnight. “If I finish painting in the morning, I might pull the tape the same evening. But the next day would be better,” says Mylacraine. Start removing the tape in an unobtrusive area and pull out at a 90° angle (picture 3). If you notice any significant imperfections, let it dry more.